A child’s world is like a quilt: a patchwork of color, movement and shapes, reflecting moods and ideas, feelings and forms. Through quilting, children can expand their knowledge of many worlds, including geography, math, literature, ecology, history, health and art. Voices in Cloth 2018 will feature quilts made both in the classroom and by individual children. 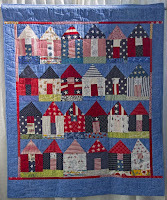 Teachers and friends of EBHQ from around the Bay Area have responded to this request to share not only the joys of the art of quiltmaking and their curriculum ideas, but their understanding and appreciation for community needs. Click here for more information, and/or if you are interested in exhibiting a group quilt made by a classroom of students or a quilt made by an individual child, please contact Deanna Lyon at (510) 527-7706 or at dlyon@wendel.com.